The 1850s heralded in Australia’s great Victoria Gold Rush, a frenzy that quickly overshadowed the California Gold Rush of a few years earlier. 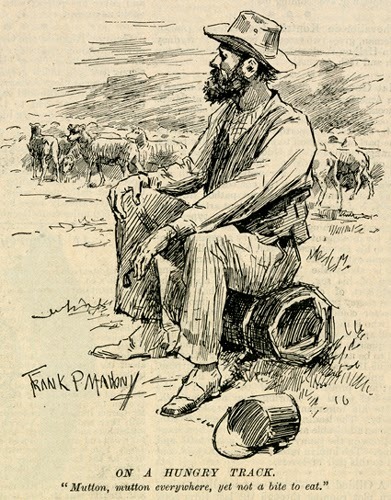 The first documented version of the song was not published until 1924, when Australian poet icon Banjo Paterson included it in his “Old Bush Songs.” The implication is that the song was around long before Paterson published it. 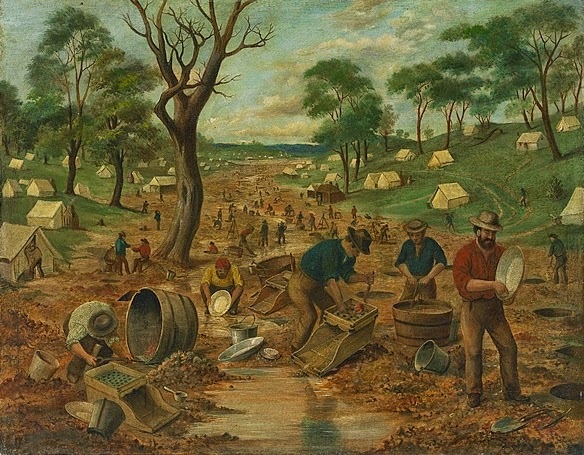 The Victoria Gold Rush increased Australia’s population by 163 percent from 1851 to 1861, making the 1850s perhaps the most pivotal decade in the continent’s history since the arrival of the First Convict Fleet in 1788. This song brings out many of these details. Could pick up lumps of gold. This refers to the frenzied news of the gold strikes that hit England with a delusional madness. Before the days of telecommunications, all intercontinental news was spread by ship. When officials first publicly acknowledged the discovery of gold in Australia, thousands of locals left their current occupations and flocked to the diggings, around what became Ballarat, Bendigo, Castlemain, and other locations. People sailing to England took the news to the mother country: Australia is the place to become rich! It was true that in some of the early goldfields, such as Mount Alexander, nuggets could be found lying on the surface for easy retrieval. Such finds were quickly picked clean, however, and the work became much harder. But news of lumps of gold lying about painted an alluring picture to the people of the British Isles. Hundreds of ships swarming with fortune seekers set out for the driest continent. All hands scuttled from the ship. Many British, Irish, and Scottish fortune seekers who could not pay for passage signed on as crew for ships heading to Melbourne. Usually, they were expected to make the return trip to England as well. However, when they reached Port Phillip Bay, it was common for the sailors to fling themselves from the ships and storm ashore to seek their fortune. Contemporary sources speak of upward of 100 ships desolately anchored in the bay without crews. Some captains gave up in disgust and went to the goldfields themselves. And some got sleek and fat. And some at Fiery Creek. And spent it in a week. Melbourne was the primary shipping port and capital of the colony, but access to the great gold centers was through the city of Geelong, which travelers could reach by a couple days’ journey on foot, or a short day’s steamboat ride. From Geelong, prospective miners launched out through the hill country to arrive, after much struggle, at the goldfields in the hills of the Great Dividing Range. Ballarat, a high-yielding field for many years, was a key destination. Upon arrival, miners had to pay a fee for their claims. Supplies were sold for high prices. The diggings were typically in dried or nearly dry creek beds. Any available water was at a premium—both for drinking, and for sluicing the alluvial deposits. By the time news got out about a new strike, it was often too late for the second wave of miners arriving to make a fortune. The best claims went quickly, making rich men out of the first to arrive. Those who came afterward had to scratch to make a living—although some latecomers found good results. One man (or team of partners) might become wealthy just a hundred feet from someone who found little or nothing. If a miner struggled for months and finally struck it rich, a feverish bliss ensued. 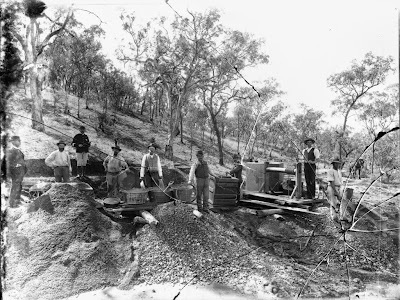 Loaded with gold, crazed diggers would often make their way back to Geelong or Melbourne and, in an amazingly short time, relieve themselves of their newfound wealth by treating themselves and others to all the amenities available. One man was reported to have filled a horse trough with champagne and invited all who passed by to have a drink—just because he could. Diggers who fared poorly at their first field often flocked to a new strike when it opened up. In the 1850s, dozens of finds were made throughout Victoria. Some turned out to be minor, others substantial, but each set off a new craze as previously unsuccessful miners sought their bonanza. Eventually, many men who had tried and failed repeatedly tired of the game and concentrated more on survival. They wandered about rural Victoria, hunting, gathering, begging, and stealing. Showing up at a squatter’s station (ranch) often resulted in a generous handout, especially if the men hung around a while to help repair fences, shear sheep, or muster cattle. Like a true-born native man. 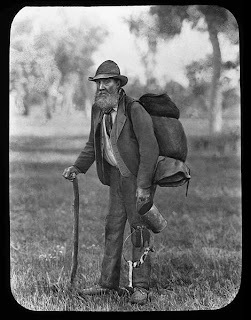 Like American hobos carrying their earthly possessions in bindles, Australian bush travelers usually carried their belongings in any sort of bag or sack they could acquire, and often swung the bag on a stick. This pack came to be known in Australia as a swag. Those who carried them were called swagmen. The term billy refers to a small can or kettle used to boil water or tea over a fire. Many recordings of this song’s variants are available. Check them out at your favorite professional music source. James S. Davis is a security officer and author in Travelers Rest, South Carolina. His passions include history, foreign cultures, folk music, agriculture, and geography. It's a pleasure to introduce my son on this blog. We are collaborating on a book partly set in Australia. Fascinating blog post. Well done! I enjoyed writing it--there's a lot more information I could have put, but tried to keep it short! Every folk song has a story behind it, and this is one of my favorites. Very nice post, Jim. I remember singing a song in grade school that was an Australian folk song. I loved it, but we don't hear folk songs much anymore. Thank you for sharing. I enjoyed seeing how the song and history are tied together. Fascinating post, Jim! Nancy, these old folk songs are real gems. One can spend hours on You-tube and elsewhere, listening to them! Australian, American, British, Scottish, Irish, and others. There are some great recordings out there. Great to know about the folk songs being available on YouTube. I love the painting you chose to illustrate this post, as well as the other illustrations. Thank you! I could do a lot of posts on different folk songs. There sure are a pile of them out there! Great post. Reminds me of the Australian song that was popular when I was younger, Waltzing Matilda, http://en.wikipedia.org/wiki/Waltzing_Matilda.